The Nepali Congress central committee meeting has started at the Prime Minister’s official residence in Baluwatar Thursday. The meeting will focus on NC’s preparations for the February 7 National Assembly elections, candidate selection process, alliances with other parties for the polls and other contemporary political issues, said NC Spokesperson Bishwa Prakash Sharma. The central committee meeting, which is the first after the recently held elections to the House of Representatives and State Assemblies, will be attended by PM and NC President Sher Bahadur Deuba, senior leader Ram Chandra Poudel, General Secretary Dr Shashanka Koirala, Deputy Prime Minister and NC leader Bijay Kumar Gachchhadar, he said. An ordinance related to the National Assembly issued recently by President Bidya Devi Bhandari states that the election to the National Assembly would be done as per the single transferable vote system. He said the Nepali Congress shall take a decision on deputing the party’s central representatives and experts’ teams in all the seven provinces to prepare for the election in view of the need for the party to provide training to the candidates and the voters regarding this election system. The government has declared February 7 as the date for the election to the National Assembly and accordingly the Election Commission has made the necessary preparations. The government on Wednesday alone appointed the Chiefs of the seven provinces and also fixed the temporary headquarters, through a meeting of the Council of Ministers. Following the government’s this move, the Election Commission too announced the final results of the State Assembly elections towards proportional representation on Wednesday itself. 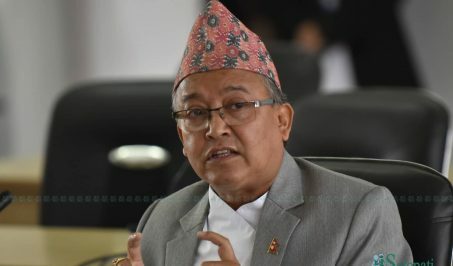 Khand said the Thursday’s meeting would only make preliminary review of the party’s defeat in the House of Representatives and Province Assembly elections due to Prime Minister and Party president Sher Bahadur Deuba’s busy schedule. He added that another meeting might be called immediately after the start of the election process for an extensive review. The NC’s meeting is taking place in the context of the demand of consolidating the party organisation as well as dissolving the central work execution and parliamentary committees, forming the party’s central departments and giving full shape to the central committee and the sister organisations and their effective mobilization, following the House of Representatives elections.